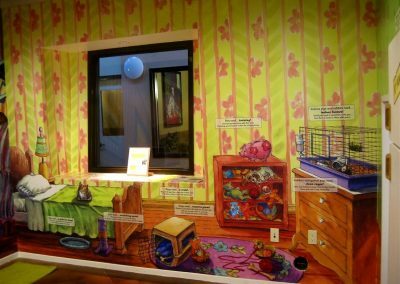 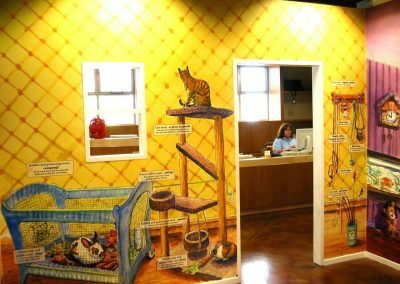 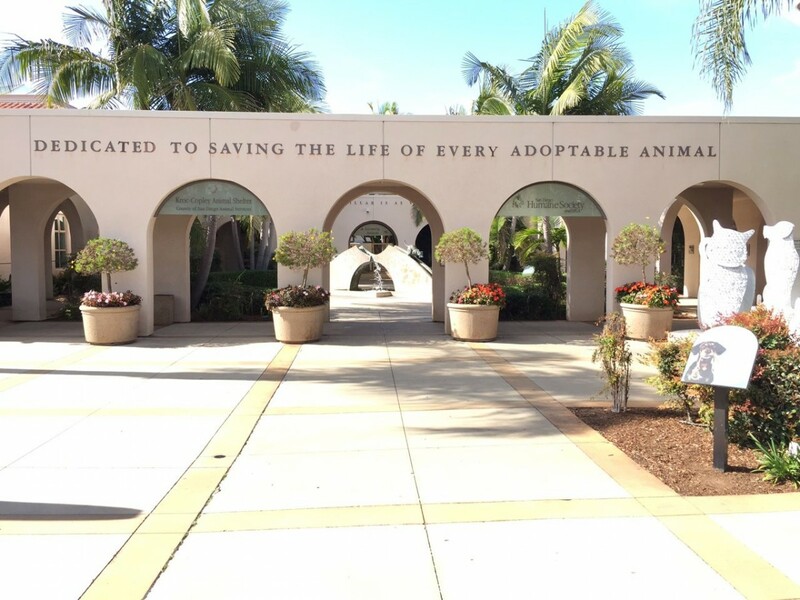 The Humane Society and Animal Shelter of San Diego are two different organizations located next to one another. 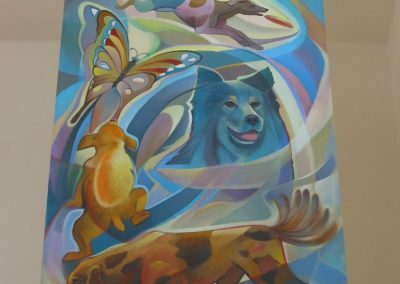 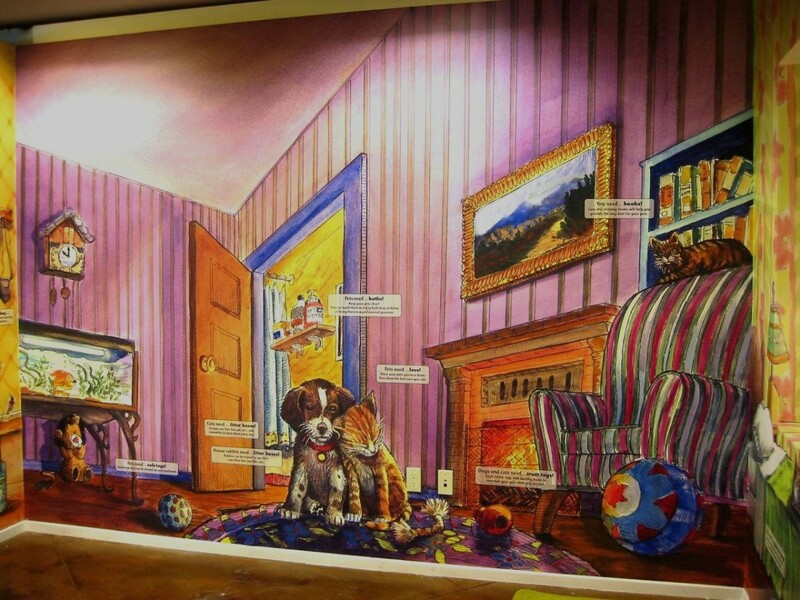 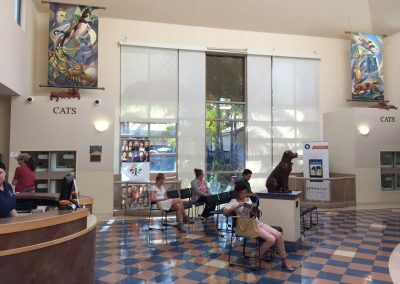 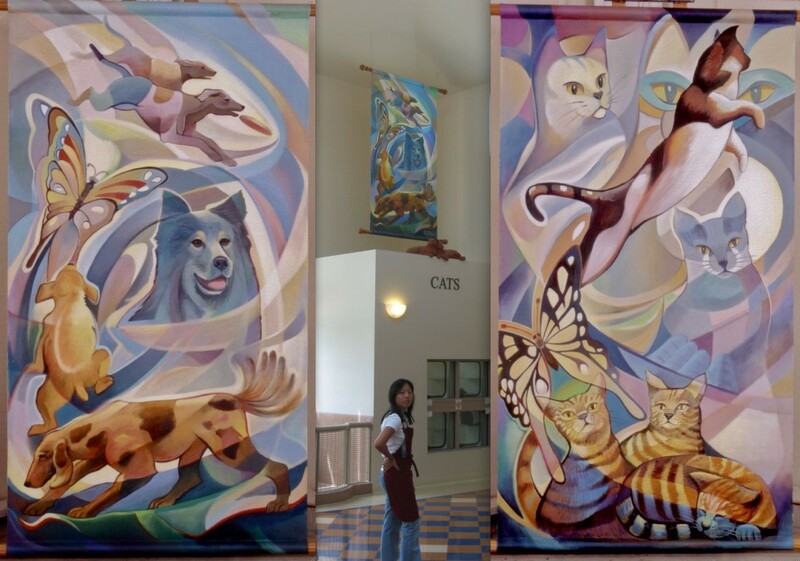 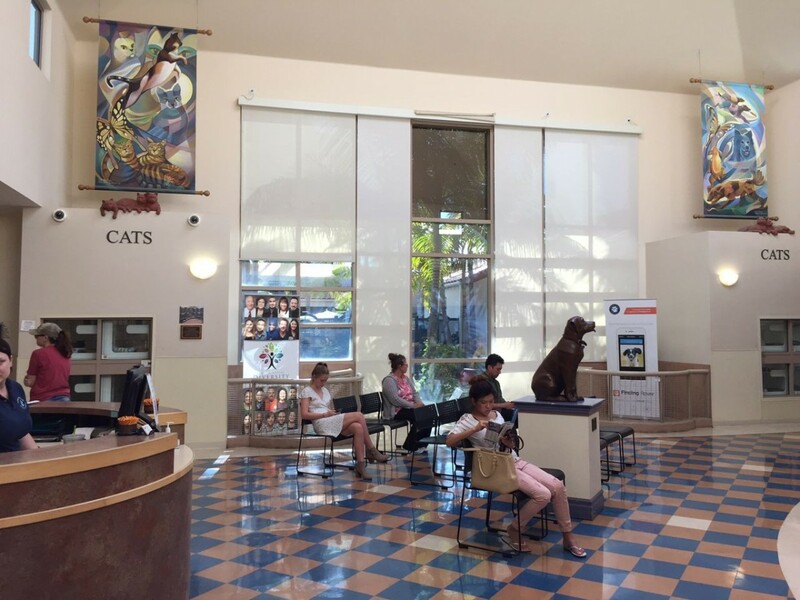 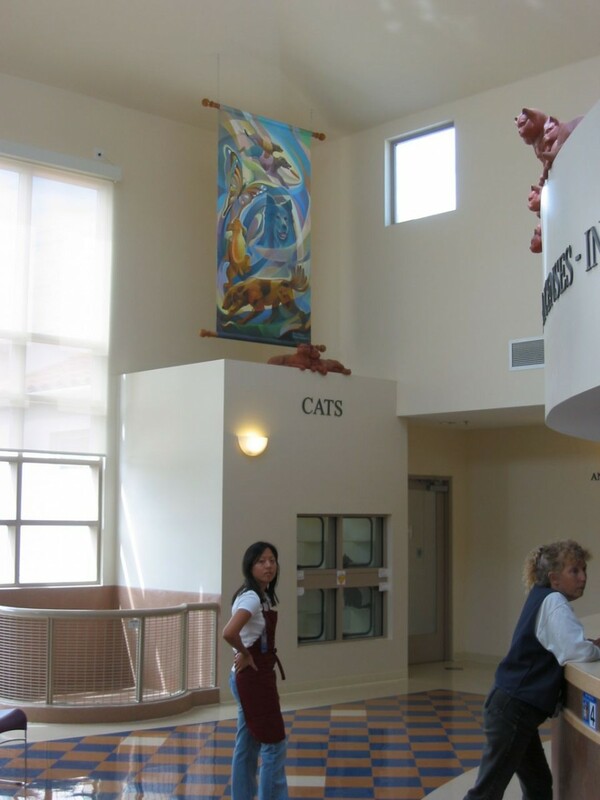 The San Diego Animal Shelter commissioned us to paint two 4x8 foot Mural banners for their main lobby. 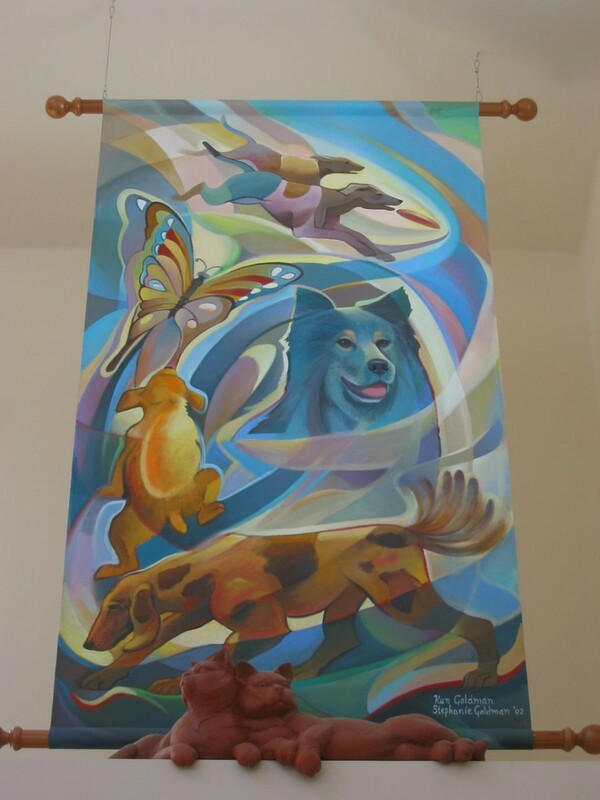 Each Banner hangs about twenty feet high at opposite ends of the lobby. 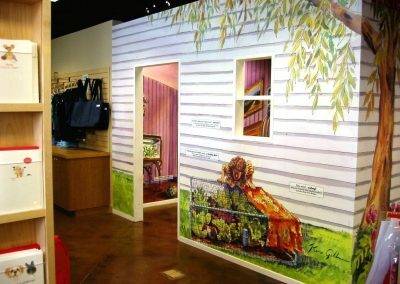 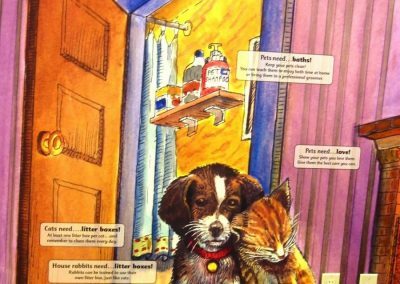 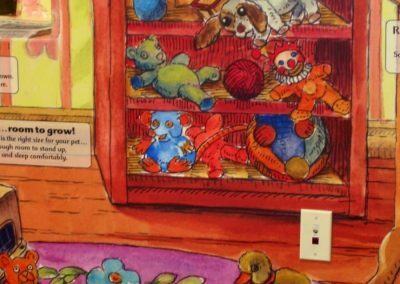 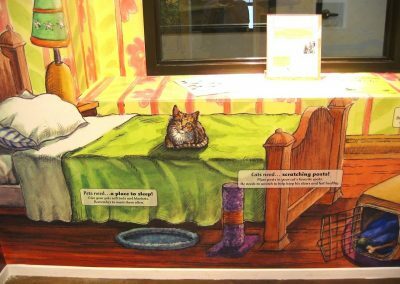 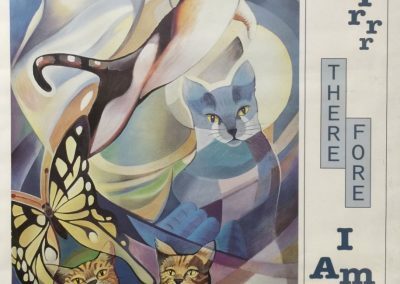 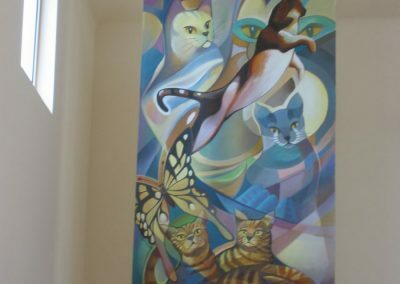 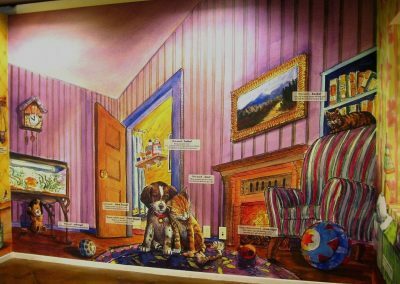 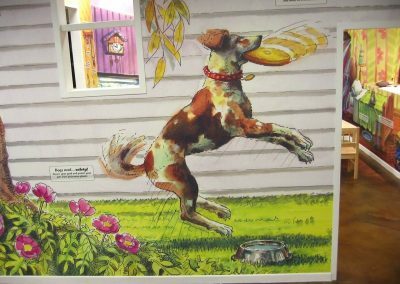 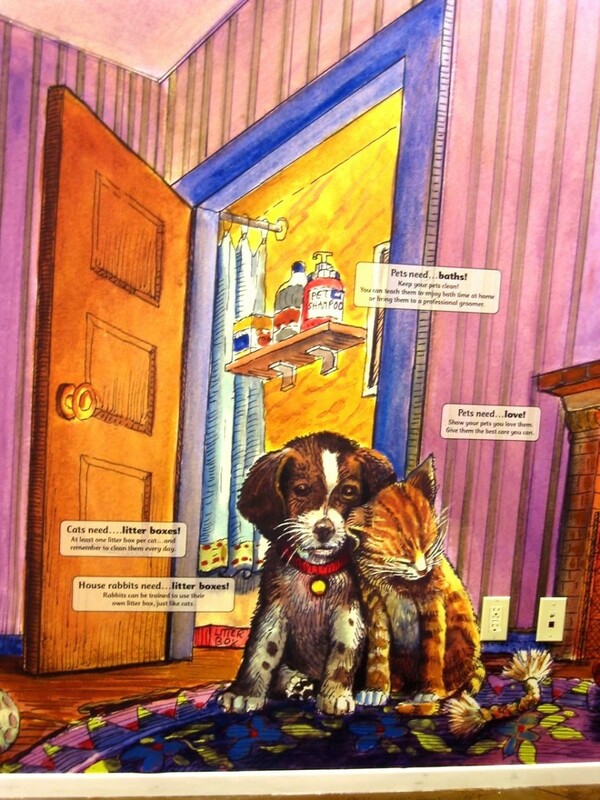 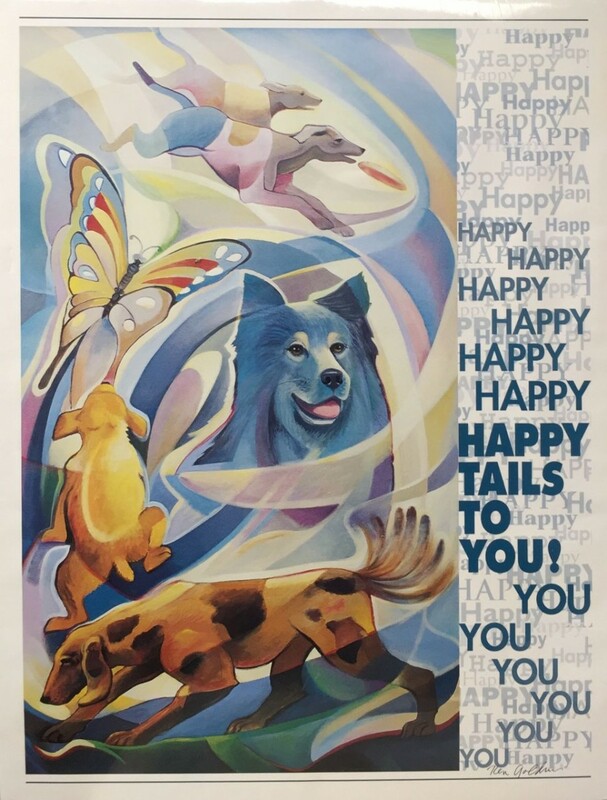 The Mural featuring Cats is called “I Purrrrr, Therefore I Am” The Dog Banner is called “Happy Tails To You.” Posters of each are available for purchase. 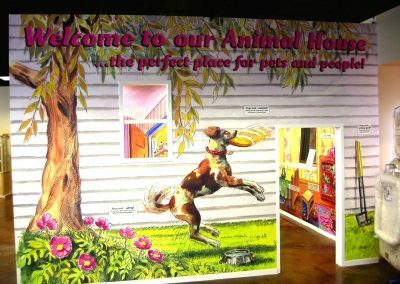 Outside the ANIMAL HOUSE - 8ft. 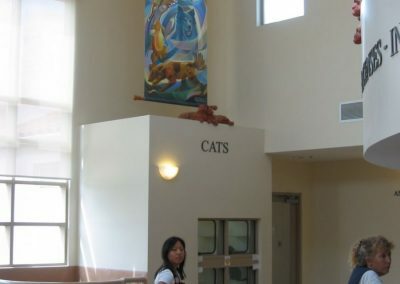 high by 12ft. 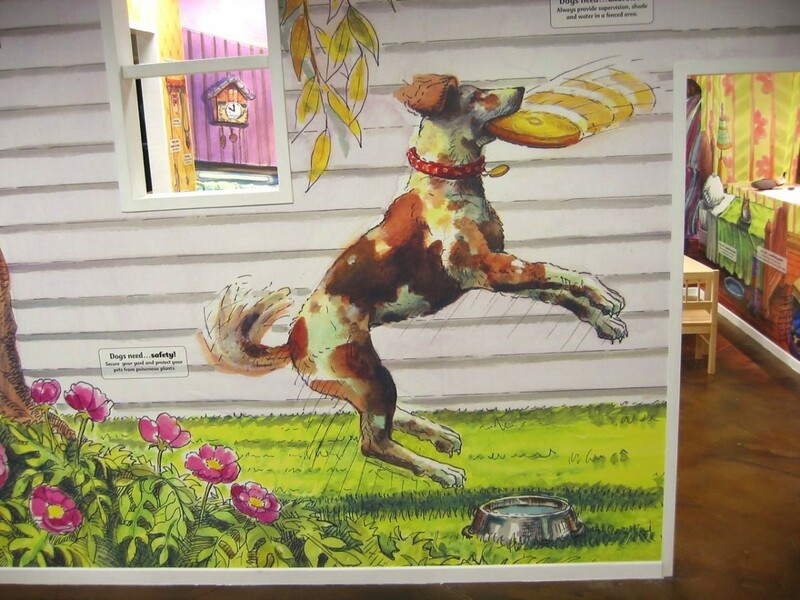 square with Murals inside and out - Dog catches frisbee. 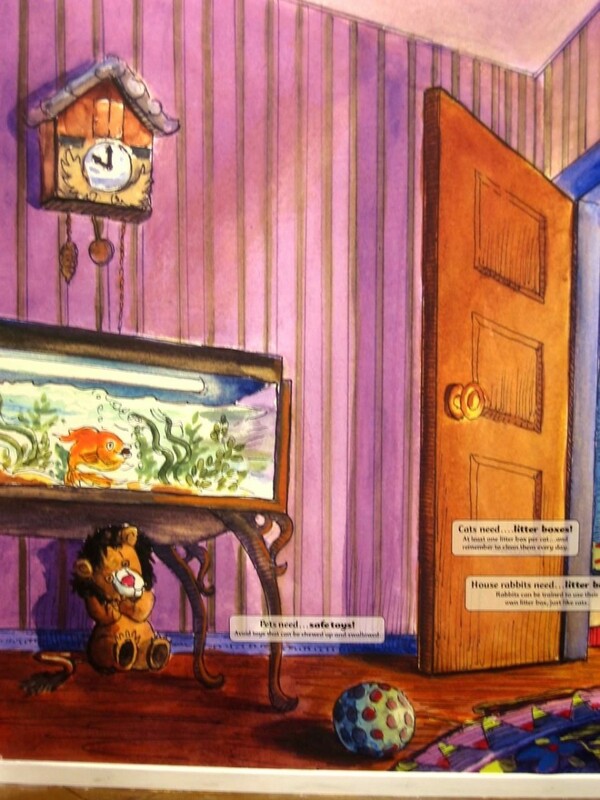 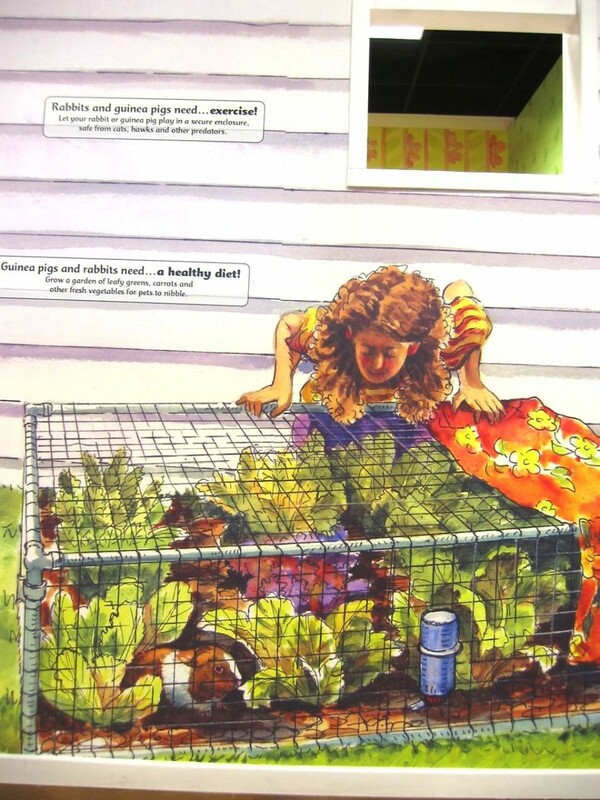 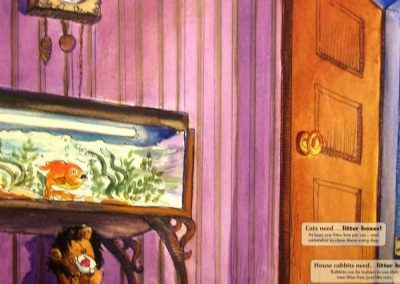 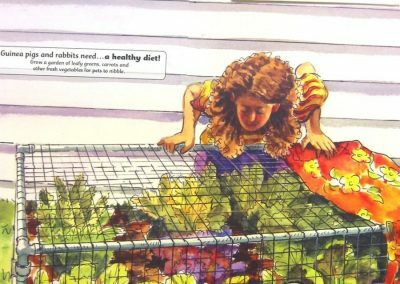 Outside the ANIMAL HOUSE - Detail, little girl with pet hamster. 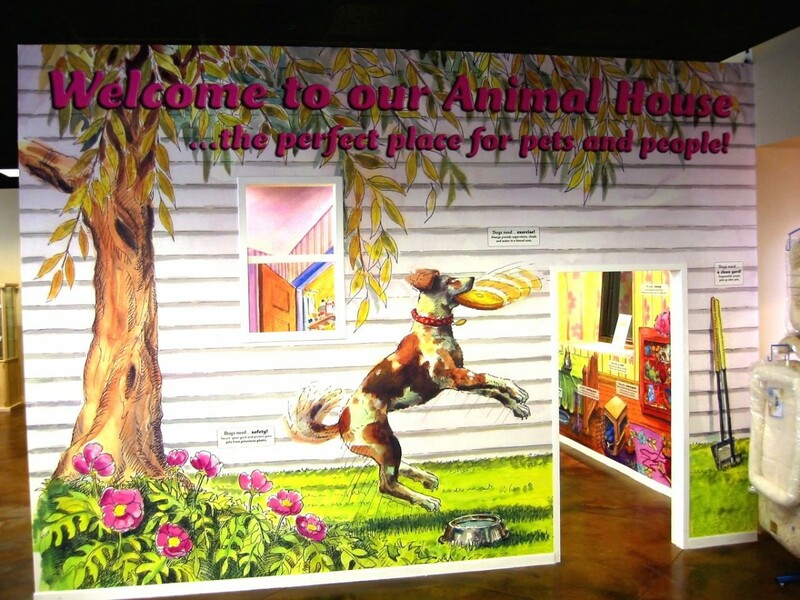 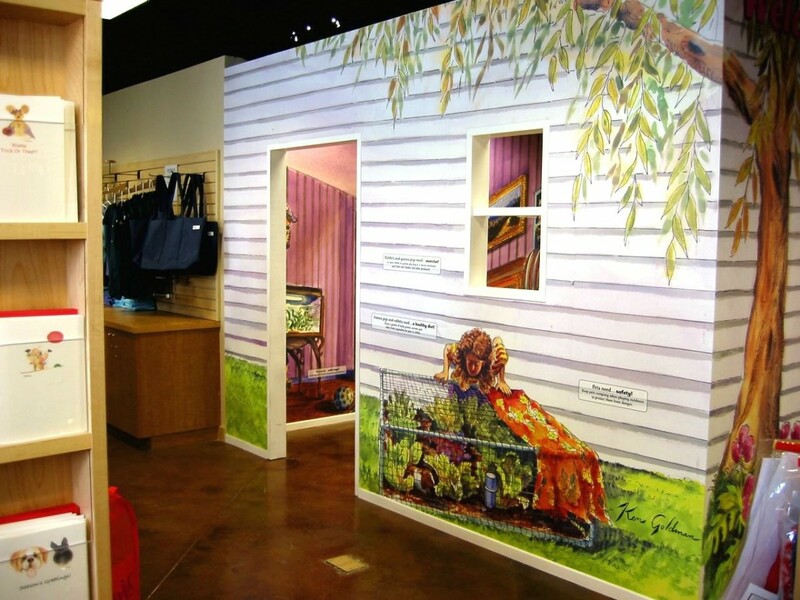 Inside the ANIMAL HOUSE - 8ft. 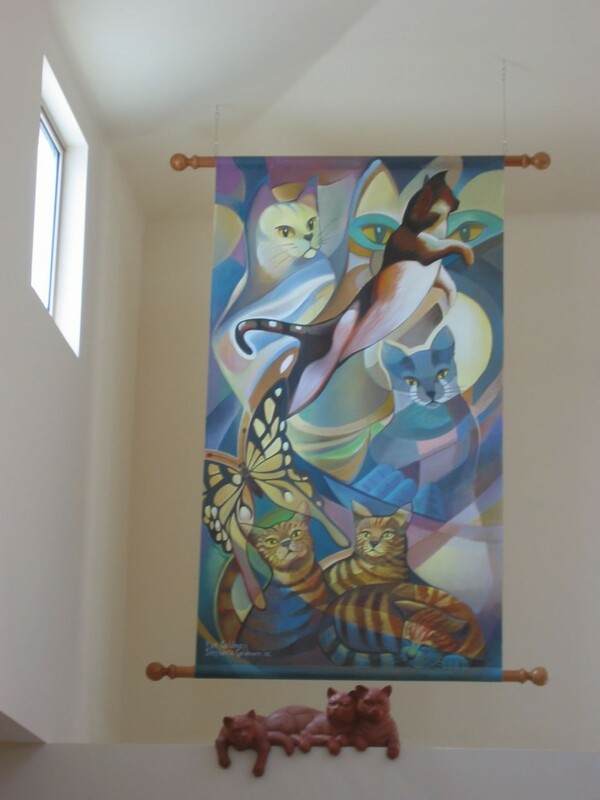 high by 12ft. 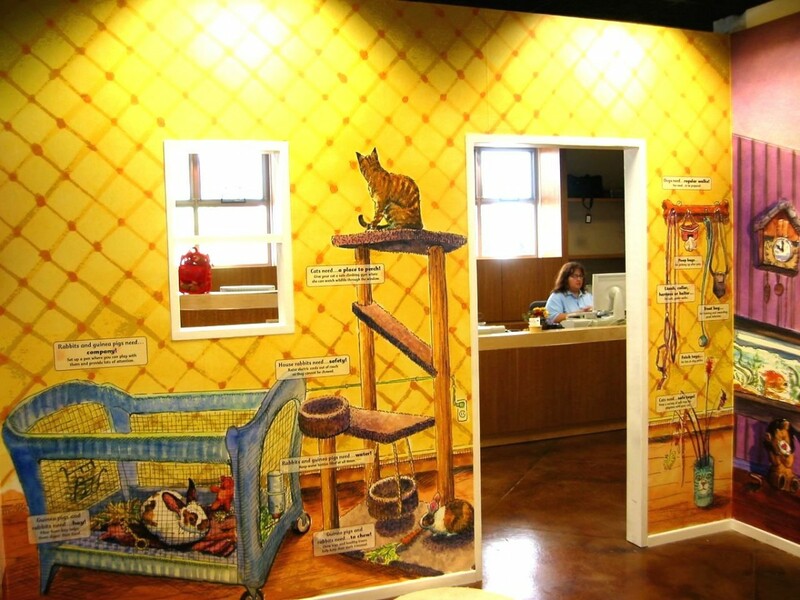 square, Proper care of cats and rabbits. Inside the ANIMAL HOUSE Detail - cat on bed. 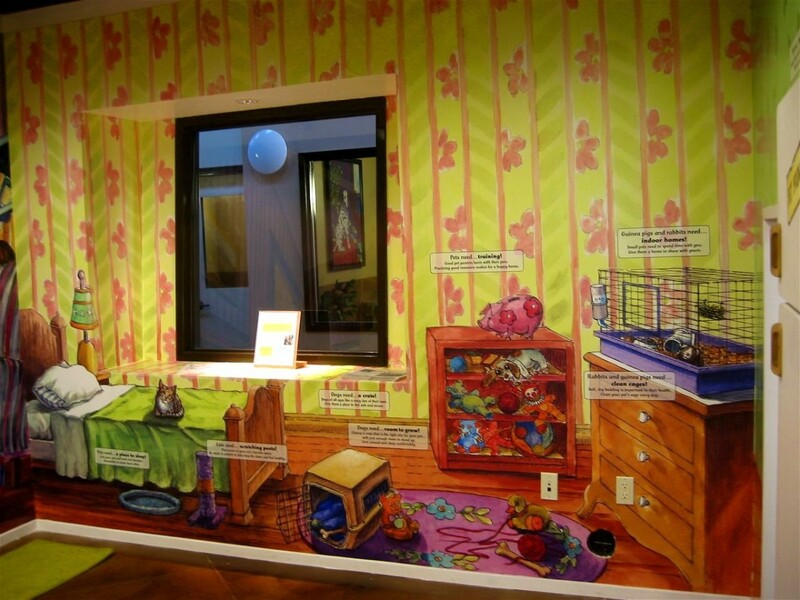 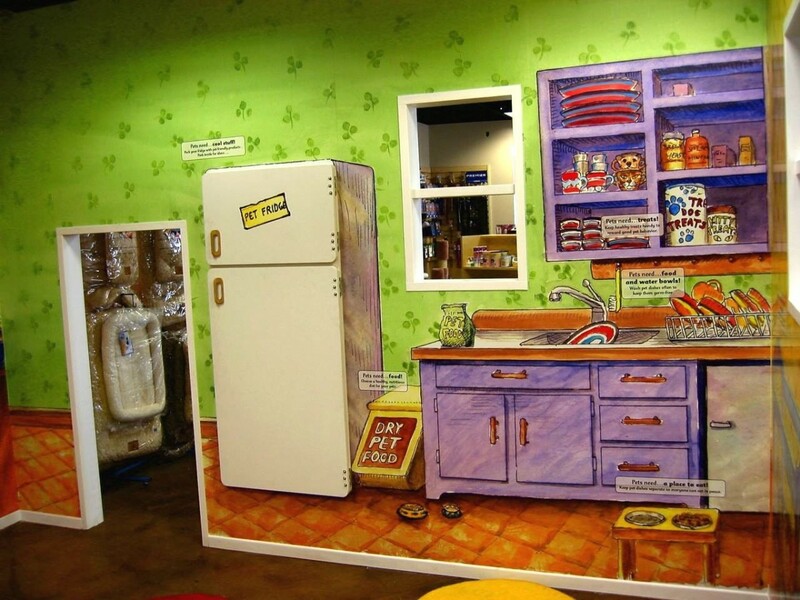 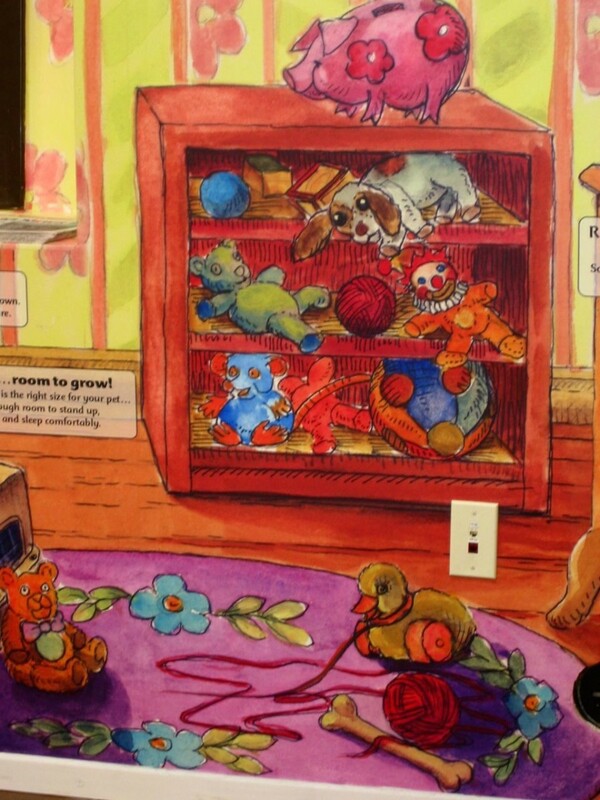 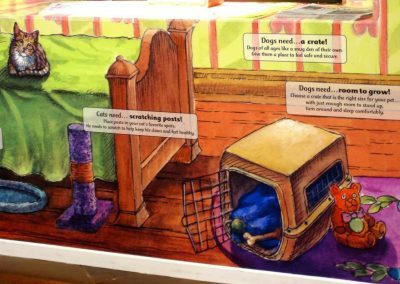 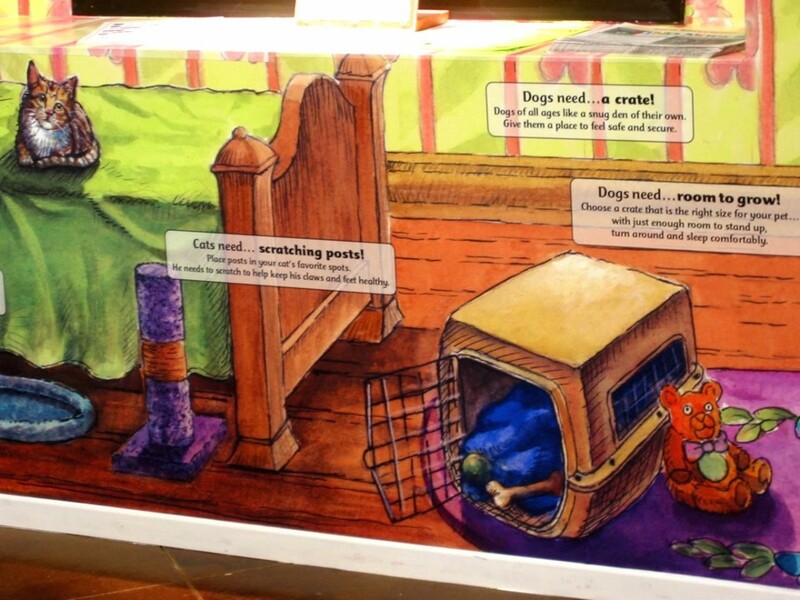 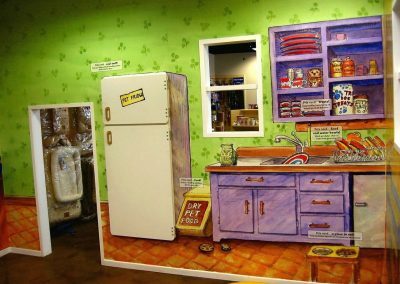 Inside the ANIMAL HOUSE Detail - Pet Kitchen. 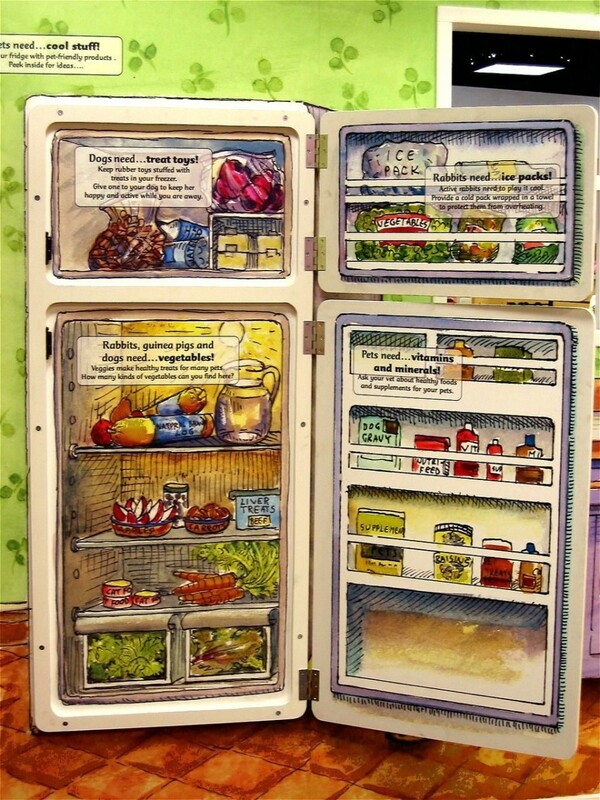 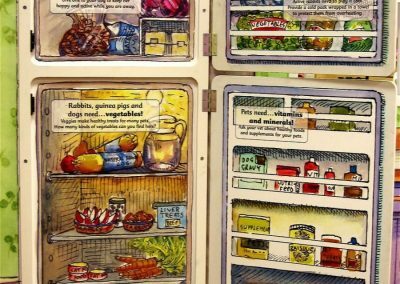 Refrigerator door opens and closes. 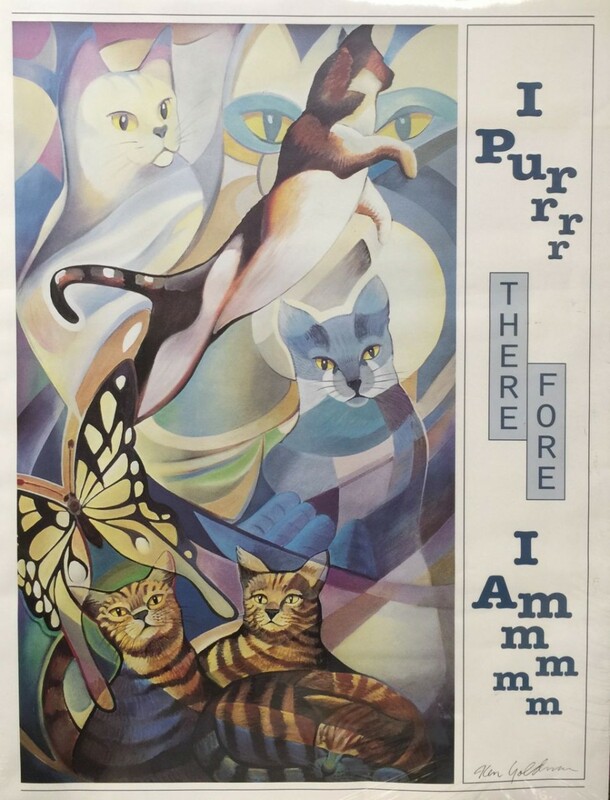 AVAILABLE POSTER: "I PURR... 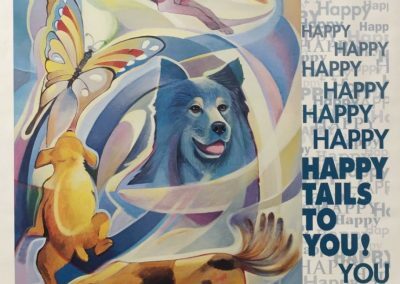 THEREFORE I AM"
AVAILABLE POSTER: "HAPPY TAILS TO YOU."